Old main panels have limitations on available space to add circuits or they have fuses ,Some old panels have had circuits added and have maxed out,Many old panels are of inferior quality and simply stop working and need to be replaced. 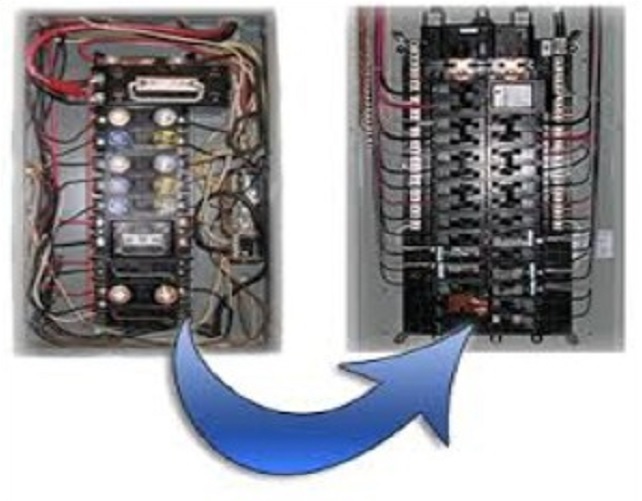 There are two main reasons you may want to replace your electrical panel or add a sub-panel: if you need to add circuit breakers but have reached the capacity of your current breaker panel, or if you want to upgrade from fuses to circuit breakers. A new breaker panel will not provide more power to your home. If your home needs more power overall, use the services of a professional electrician to upgrade, a process that will include a new breaker panel as well as other accessories, such as new cables and a new electrical meter. Book a consultation with our licensed electricians to upgrade fuse box to breaker panel across Toronto, Brampton, Mississauga, Milton. Certified electricians at H MAN ELECTRIC upgrade fuse box to breaker panel across Toronto, Brampton, Mississauga, Milton, North York, East York, Oakville, Richmond Hill, Aurora, Newmarket, Brantford, Markham, Vaughan, Pickering, Ajax, Oshawa, Scarborough, Whitby & surrounding Greater Toronto Areas (GTA) for more than 10 Years.